This was our view on Saturday ~ WOW! The sights of Alaska were simply breathtaking & we found ourselves wondering if we were really seeing what was before our eyes. Saturday was a long awaited day at sea & we enjoyed the little bit of down time. There were lots of opportunities to view the glacier because the Captain turned the ship so each side and the back would have a chance to view it. It was spectacular. 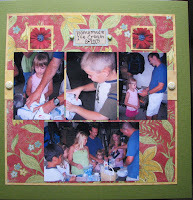 I promise I will get back to stamping and scrapbooking one of these days! I just have to get through this week of VBS and the crazy work schedule. 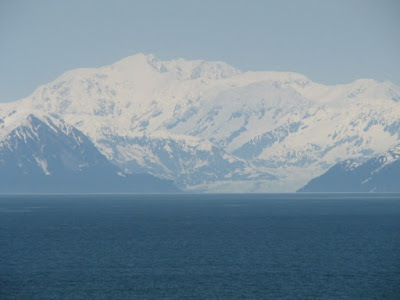 We made our way from Anchorage to Seward to board the ship on June 8th. After so many days of moving around, we were ready to board the ship and sleep in the same bed for more than one night. 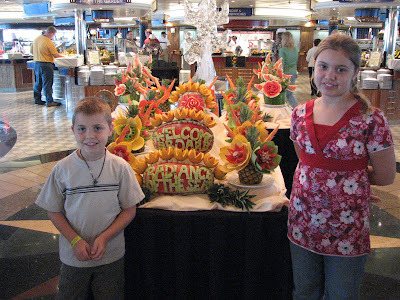 After checking out our very cool room, we went to eat ~ OF COURSE ~ because that is what you do on cruise ships! The kids had a grand time running all over the place with their new friends, Jack, Kiley & Quinn. We met them on the land tour and they all spent many hours traveling together. But now that we were on the ship, they were allowed to roam (with some limits). It was wonderful that the kids found such great friends on the trip! Just a quick note about Stampin' Up! I just wanted to add a quick note to my customers about the new Stampin' Up! Idea Book & Catalog! UPDATE: THEY ARE HERE!!!!! 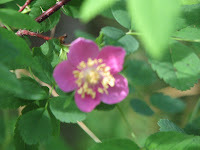 We woke up in Denali and spent some time walking around the grounds of the Lodge. At noon, we boarded the glass-topped train to Talkeetna. The trip south was beautiful and much more of what I thought Alaska would be like ~ lots of trees and mountains. When we arrived in Talkeetna, we stayed at the beautiful Talkeetna Alaskan Lodge ~ WOW! That evening we went on a river float trip which was a bunch of fun! Matt really enjoyed rowing the raft and didn't get us into too much trouble! 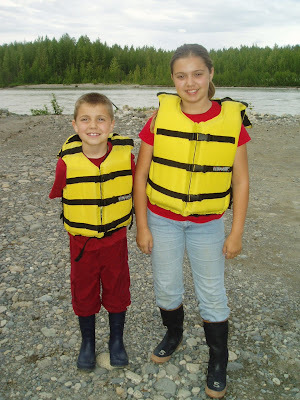 After the float trip, we walked around downtown Talkeetna ~ can you say Northern Exposure? It's a itty bitty town with LOTS of character. We loved walking around and soaking up the small town feel. The next morning we walked back into town for breakfast and bought a few things to remember our trip. That afternoon we boarded the motor coach for Anchorage. Soon after we started the trip we were stopped because of an accident. We did get to see a helicopter land right in front of us and it turned out that everyone involved in accident was o.k. We didn't really have anything going on in Anchorage, so the 2 hours we sat in our motor coach wasn't a big deal for our trip. We were just thankful everything ended well. We spent the evening in Anchorage. We didn't see too much because we were on our own and walked around for a short time. After being in the many small towns and the wilderness for several days, it was culture shock for sure! 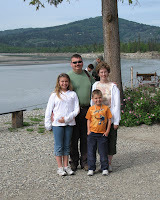 We decided that we really enjoyed the remote areas of Alaska more than the big city. We woke up to lots of rain in Fairbanks that morning; however, we boarded a train for Denali National Park and hoped the weather would clear up. From the picture above, I would say it did in fact clear up! This was our view of Mt. McKinley later that day. This photo was taken 35 miles away and it was magnificant! Only 10 to 20% of the visitors to Denali get to see this view ~ how blessed we were that day! 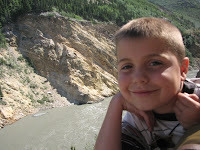 As I said, we started out on a train from Fairbanks to Denali National Park. The train was wonderful and provided a fantastic made-to-order breakfast and a glass top on the 2nd story for great viewing. The weather cleared up soon after we left Fairbanks and one of the highlights was our approach into Denali. Once we arrived in Denali, we boarded an old school bus for an 8-hour Tundra Wilderness Tour. Boy, was that a LONG tour! But in the end, it was worth the time spent. That's when we saw Mt. McKinley, 2 grizzly bear, a moose, dall sheep, golden eagles, and caribou. At the end of the day, we fell into bed ~ what a day! The first day of our vacation wasn't too exciting since we spent most of it on airplanes, waiting in airports, and getting yelled at by a crabby old woman who Matthew had the displeasure of sitting in front of on the plane. Bless his heart, he was so good and hardly touched her seat when she turned around and yelled at him. After the third time, I yelled back and she didn't bother us anymore. 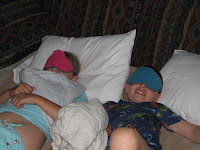 Once we finally arrived and found our lodging, it was rather amusing to see the kids reation to 21 hours of daylight! It took awhile, but they FINALLY fell asleep that first night. The sun set at 12:15 am and then came up again at 3:15 am, but it never really did get dark, just dusk. The fun really started the second day. 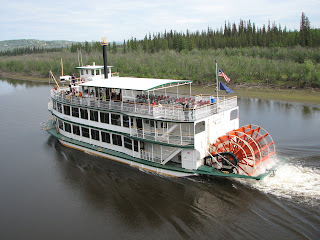 We enjoyed a 3 1/2 hour Riverboat Cruise on the beautiful Chena and Tanana Rivers. We learned that "na" means river in the native indians language. They provided some fabulous demonstrations by a bush plane and at Susan Butcher's sled dog mushers camp and then we toured a beautiful Athabascan Native Indian camp. It was a beautiful morning! The next stop was lunch in downtown Fairbanks. We tried a little place called Soapy Smith's. The decor was great but the food was so-so & the owner was a bit overbearing. After a short walk around the downtown area, we stopped to get a good look at the Alaska Pipeline ~ which was very interesting! Then ... it was time to pan for GOLD! That was a ton of fun and the kids were sure they would be rich by the end of the day! Between the four of us, we managed to pan about $25 worth of gold flakes, but we had a great time looking for those big gold nuggets. Wow! What a trip! After two weeks away, we arrived home in the wee hours of Saturday morning. We had an amazing time in Alaska & feel so blessed to have seen and done so many wonderful things. Tim took this amazing photo on the last day of our cruise while we were going through the Inside Passage. We took about 1,400 pictures between our three cameras, so I will have lots to share. I've heard from many of you that you enjoyed my entries during our trip. I'm sorry I couldn't get online during the cruise. Once we arrived on the ship, we had limited internet coverage from Tim's computer and the ship's internet charges were outrageously expensive. Therefore, over the next week or so, I am going to try and do a day-by-day picture log now that I'm home. This way, I can share some of our beautiful pictures and I can document some of the highlights. (And that way I won't forget everything by the time I get a chance to scrapbook this trip!) So stay tuned for more Alaska entries in the days to come! Just a quick update before I hit the sack. We are in Anchorage tonight after spending yesterday in Talkeetna. Can you say Northern Exposure? Apparently, the teeny tiny town of Talkeetna was the inspiration for the TV show Northern Exposure. We went on a raft trip where Matt got to help row the raft. We did manage to spot a few Bald Eagles, but that was about it. We stayed at the Talkeetna Alaskan Lodge -- GORGEOUS! The locals cracked me up and we had a great time. This afternoon, we boarded our motorcoach for Anchorage. The hotel is beautiful and the kids were happy to play in the pool. Other than that, I enjoyed the Alaskan wilderness much more than the big city. Tomorrow we board the ship & we are all ready for that. It's been a wonderful four days, but we are ready to unpack our bags and sleep in the same bed for more than one night. I'll check in when I can... not sure what kind of internet access we will have on the ship. OMW! What a day we had yesterday! We boarded the most goregous glass top train where we had wonderful views the entire trip. On lower floor, we dined on a fabulous breakfast while we tried to find moose. The end of the trip into Denali National park was AMAZING! I can't wait to post pictures. After we left the train, we boarded a bus for an 8 hour trip into Denali National Park on the Tundra Wilderness Tour. The weather cleared up beautifully on the train and then we ended up having one of the rare days that we could actually see Mt. McKinley from the very beginning of the day until the end ~ only about 10% of visitors get the clear views that we saw yesterday! We drove within 35 miles of the mountain & it was fantastic. How blessed we felt to be part of that day. 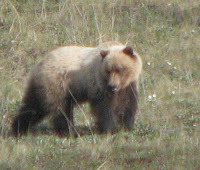 We were also fortunate enough to see Dall Sheep, Golden Eagles, tons of Caribou, moose, fox, rabbits, and then at the very end of the trip... 2 grizzley bears (momma and cub)! It was so exciting! We then found our way back to the lodge & collapsed into bed! What a day! Today...we are on our own this morning and are just taking it easy. We board the train again at noon where we will have lunch and make our way down to Talkeetna. This evening we have a float trip planned. Have a wonderful day ~ I'll check in when I can! Good Morning to the Lower 48! Just a quick hello to all of you down in the lower 48 (states that is)! OK! I just have one question. Are we supposed to sleep on this trip? Between the very busy schedule of activities and only 3 hours of darkness (from 12:15am to 3:15am), we are all dragging a bit this morning. We are about ready to leave a cloudy and drizzling Fairbanks, Alaska this morning to catch the glass top train & beautiful Denali National Park. Later we will move on to Mt. McKinley for the night. Yesterday was a fantastic day in the 70's with full sun. We spent the morning on a Riverboat for a wonderful tour along the river (sorry I can't remember the name right now ~ but I'll fill in the details later). We saw floatplanes take off and land, a mushers training facility and an eskimo village. Then we spent some time in Downtown Fairbanks for lunch at Soapy Smith's and a quick stop to view the Alaska Pipeline. 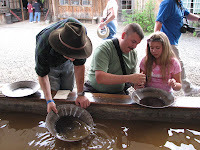 The highlight of the day was panning for gold at the El Dorado Gold Mine where we scored about $25 in gold. We got some great shots which I'll have to share later. Last night for dinner we went at the Great Alaska Salmon Bake. Then we fell into bed at 11:00pm (3:00am Eastern time)! It's Summer time! Do you need a fun activity to do? We are leaving in a few hours for our vacation. I'm all ready so I'm killing time on the computer until we leave and thought I would post this fun summer activity. 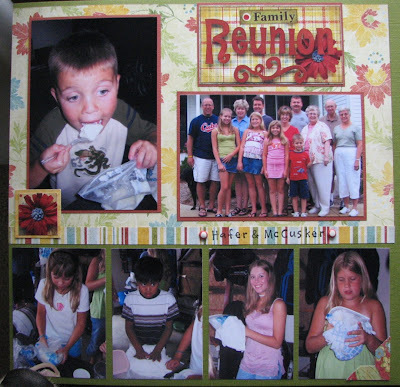 Since the hot weather is here in Indiana, it made me think of something we did a few years ago when our family came down for a visit. We made homemade ice cream in a Zip-Lock bag and both the kids & the adults LOVED it! Here's the recipe if you want to give it a shot. Note: Use regular Zip-Lock bags, not the bags with sliding locks (TRUST ME THEY DON'T WORK). Put Half-n-Half, vanilla and sugar into a quart size bag. Get as much air out as possible & seal well! Fill the gallon sized freezer bag with 3 or 4 cups of ice and add the rock salt. Put the smaller bag into the larger bag, get as much air out as possible and seal well. Wrap a towel around the bag or have the kids put gloves on & then shake and mix until the ice cream thickens (about 10 minutes). Top with sprinkles, candy, nuts or fruit & ENJOY! I'll see you all in 2 weeks when I return from Alaska! If I have access to a computer, I'll post an update here about our trip.